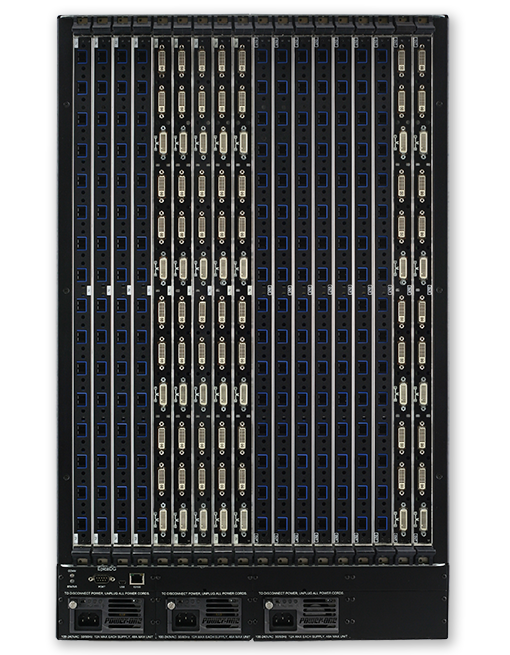 The Epica DGX 144 is a modular fiber optic matrix switcher designed to transport uncompressed video, embedded audio and one-way control up to 3000 feet away over single strand multimode fiber. With its exclusive DGX Technology, the system offers simple signal conversion between analog and digital signals and vice versa whether it is needed at the source, the switch or the destination. Supporting 4.95 Gbps, the DGX ensures perfect pixel for pixel reproduction for all video resolutions up to 1920x1200. 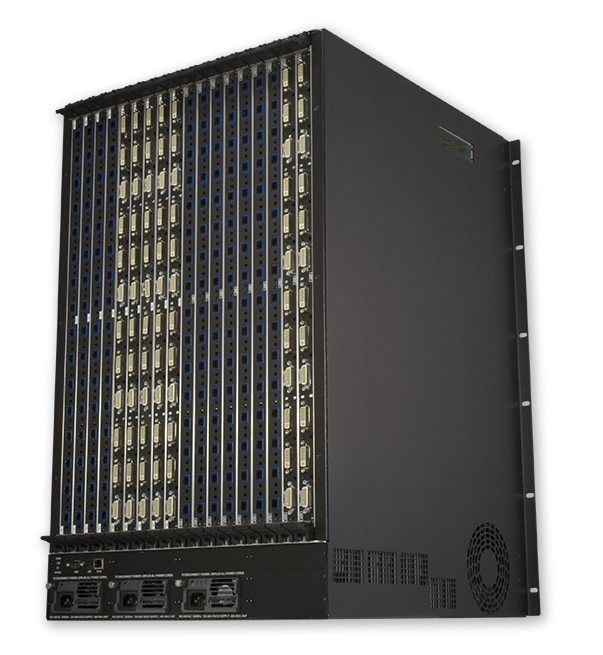 Designed with flexibility, the compact 16 RU enclosure is expandable from 16x16 to 144x144 by increments of 16 and supports DGX Fiber, DVI and HD-15 input boards and DGX Fiber, and our DVI output boards. 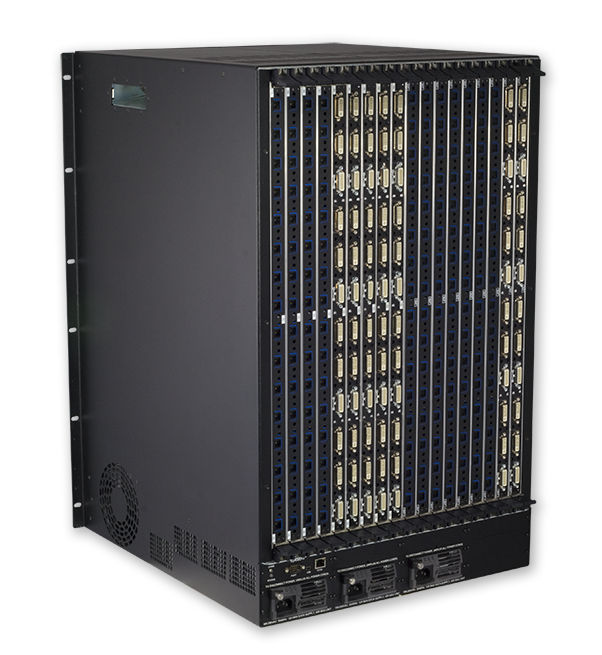 It features several integrator friendly tools designed to simplify setup and reduce installation issues including hot-swappable I/O boards, real-time system monitoring, and fully redundant, hot-swappable power supplies with redundant power feeds. When paired with the DGX Fiber Transmitters and Receivers the system can also pass audio and control sent from the TX through the matrix switcher to the RX. The DGX Fiber Receivers (both HD-15 and DVI) feature SmartScale™ Technology which automatically responds to the display's declared EDID information and scales the video resolution and adjusts the video parameters to match the displays native format. SmartScale Technology ensures every display operates at its preferred resolution and eliminates the incompatibilities that can arise in matrix switching systems when the output resolution of the source is not supported by some or all of the displays in the system. 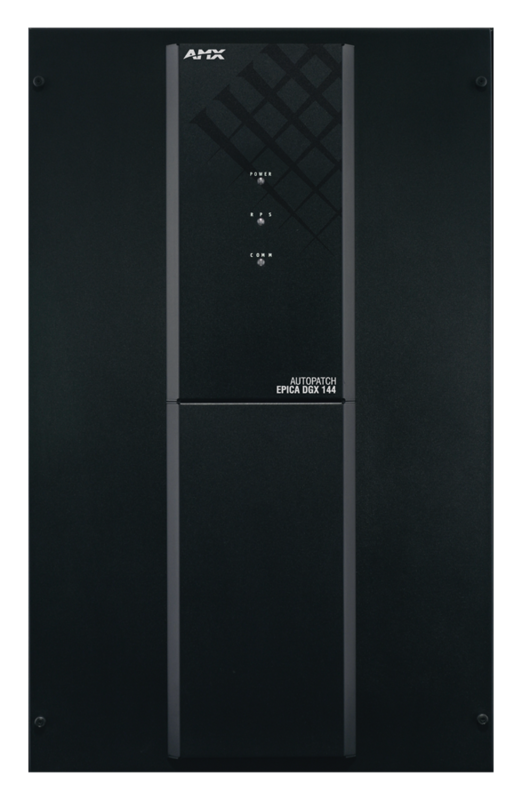 The Epica DGX 144 can route and transmit pure high resolution analog and digital video up to 3,000 feet making it the perfect solution for government agencies, command-and-control environments, universities, hospitals, casinos, retail environments or any facility that demands the highest quality video be shared between rooms or even buildings. AMX manufacturers a full range of customizable matrix switchers to accommodate multiple signal types in various input/output ranges. Please contact us at 800.222.0193 (US) or 469.624.7400 (International).